mlk day, homemade caramel popcorn on national popcorn day, inauguration, testing the roomba, breakfast w/ michaelmas at joe’s cellar, attending the handwriting day seminar w/ michaelmas, finding a cute coat & skirts at fat fancy, hooping (which was wonderful but after being gone for so long was pretty exhausting), snow! sam adams. oh, sam adams. he's not my hero anymore, but i can't think of anyone better to be mayor. i hate that he lied, but i also recognize that gays are socialized to have to lie about their relationships and however they approach it they will probably be damned for it. i don't think he'd lie about anything related to his job, but i think an inquiry is appropriate. my mom's death is becoming quite the soap opera: there's now a contested will, fear, betrayal, lying, scheming, grifters, a potential common law marriage, anger, crying, pressure. many difficult phone calls have been made. more will be made this week. on top of it all, i was sick: a minor cold that made me sniffly, scratchy & tired. i slept downstairs because of my congested snoring. so. everything feels like it's falling apart. it will get darker before the dawn, but hopefully that's not too far away. * i've started my new hooping class: hooray! on the first day i discovered a hoopjam right after class so i went to that, too (beautiful space in the building between art media & finnegan's). but that much intense hooping left me sore & bruised for days. alas, then i missed two weeks of class because it conflicted with backline training (below). i really wish i could have done both! * i went to the living room theatre to see let the right one in, a swedish vampire film, which i am still thinking about (i think that's a good sign). i didn't leave the theatre cheering, but i really appreciated its fairly deft touch and things left unsaid about the relationships. now that i've checked the wikipedia i realize some things are different than the book, but i think i might like the film better because of the changes. * i returned a rainjacket to patagonia, which is primarily worth mentioning because i bought this jacket in april. they have a lifetime return policy and i wanted to see if they honoured that -- which they totally did. i tried this jacket a few times while biking but because it was unlined it stuck to my skin & felt clammy, so i traded it for a different jacket that i hope works better. * sven & i saw hancock, which i was expecting to be pretty bad based on the first 10 minutes, but then turned out to be pretty good. i have a fondness for stories about how people with extraordinary powers get along in the mundane world. * sven & i went to vindalho, which had some really fantastic dishes, a couple of less-than-fantastic dishes, but weird service. * sven & i also watched the day the earth stood still, which i have never seen. i was pleased to find that i liked it. * i was delighted that oregon & 6 other states were willing to sue the federal government over the dhhs rule which forbids federally funded sites from taking action against health-service workers who individually deny legal goods & services to women. i hope it comes to something. * during the height of the windstorm, we had a blackout for over and hour and a half. i love blackouts, in part because it's so much easier to see the sky from our house. 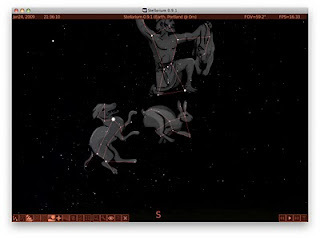 so i took the opportunity to starwatch: i was finally able to see lepus and the whole canis major constellation. 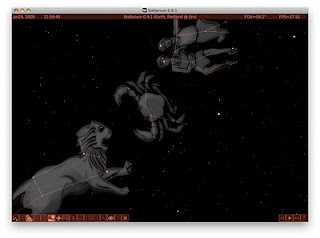 i was also finally able to see cancer, which is an incredibly faint constellation between the twin stars of bright gemini and the regal and distinct figure of leo. when the lights came back on, it became even harder to see, but now i know what i'm looking for, at least! * over the last couple of weeks i spent over 50 hours in training & doing "homework" for a position at backline. pro-choice is so often fought about abortion because it's the choice that's most likely to be taken away, but i like backline because it simply lets women talk about their pregnancies and supports any decision they make, whether it's parenting, abortion or adoption. i met a lot of great people and feel pretty good about the organization. i'm still nervous, but working as a patient advocate has helped me feel more prepared for it. * my mom died unexpectedly. sandy was the first to tell me, then others saw the obituary and contacted me (thanks, everyone!). i hope to write more about it soon, but emotionally and legally it's complex, and it was harder to deal with because of all the backline training i was doing. i'll probably be spending the next few weeks sorting it out. i'd prefer not to travel to colorado if i can help it, though. christmas 2008: a lovely blur of shepherd’s pie, scrabble, a walk around the neighborhood knee-deep in snow, fireworks at midnight, cookies & milk, tucking the "boys" in bed, sirius the christmas star and some wonderful presents from wonderful people. also, i finally closed my studio's artist’s way group support list after almost 4 years. alas, trixie's battery failed and had to be replaced when it became clear enough to drive to the dealership, but the melting snow revealed strange pockets of river stones, potatoes & ecstatic, ravenous robins. sven & i ventured forth to try ya holla, which was fairly tasty. nye 2008: we had a leap second at 3:59 p.m.! at midnight we ran up the hill carrying tiny bottles of champagne and straws with firework tinsel. we heard our neighbors count down the seconds and then watched portland erupt in fireworks while we sang auld lang and “this will be our year.” a little boy up the hill kept yelling “happy new yeah!” i have a tradition of staying up to see the first dawn of the new year. staying up late this year was HARD, and by the time we got outside torrential rain was blowing sideways. we slept in and had just enough time to make it to grace's potluck and housewarming, to which sven brought rumballs. i finished a whole book in one day (this common secret) and the next day received a personally inscribed copy of david allen's "making it all work" from paul & shelley (thanks, guys!). then michaelmas sent a bunch of itunes gift albums for me. watching david lynch's "inland empire" wasn't nearly as successful, though.